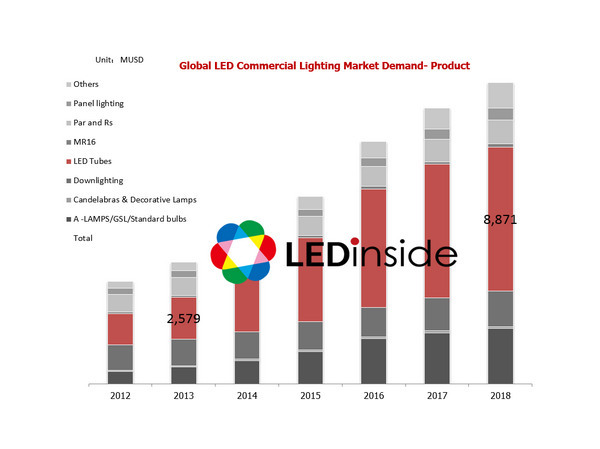 Global LED commercial lighting market penetration rate this year soared, with growth projected to reach 23% by the end of the 2014, according to the latest “2Q14 Silver Member- Commercial Lighting Market” by LEDinside a research division of TrendForce. Main lighting products in commercial lighting application include LED tubes, spotlights, and bulbs. Europe, North America, and China are the biggest players in this sector and are anticipated to become major markets within the next five years. LED tube market demand was US $2.58 billion in 2013 and will increase substantially to US $8.87 billion by 2018, said LEDinside Associate Manager Joanne Wu. LED tubes have become prominent in the commercial lighting sector, especially in supermarket, office, and underground parking lot where LEDs have been applied extensively. In addition to rapid improvements in design, LED tubes strength in cost/performance (C/P) is also increasing faster compared to other luminaires. “T8 tubes have been the main product in many regional markets, due to their use in office lighting applications”, said Wu. The European, American, Japanese, and Chinese market mainly uses cool white tubes. The Chinese LED tube market in particular mostly uses cool white color temperature of 6,500K with a lifespan of only 25,000 hours. In the U.S., Cree released their new LED T8 tube in March 2014, dramatically shrinking the price gap between traditional fluorescent tubes. The T8 tubes are competitive in both price and lifespan, promising 50,000 hours and a five year warranty. To keep up with their LED lighting replacement target, the company plans to continue previous LED bulb marketing strategies, bringing the commercial lighting back under the limelight. The Japanese commercial lighting sector favors 1,198mm, 5,000K LED tubes which have a lifespan of 40,000 hours and average luminous efficacy of 160-170lm/W. Japanese manufacturer Rohm offers LED tubes with the highest luminous efficacy of 190lm/W. In addition, 2,367mm tubes can also be seen in outdoor industrial and subway lighting projects. In regards to commercial lighting market strategy, one of the most basic development strategies for European, U.S., and Japanese manufacturers is improving product quality, which includes boosting luminous efficacy, lifespan, and light quality. Luminous efficiency, lighting uniformity, color rendering, and lifespan are still considered key technologies. In another aspect, Chinese manufacturers strategies are more dispersed. Due to the Chinese lighting market still maintain high growth rates, there is no definite success model. However, overall distribution channel advantages are still their biggest weapon. Price competitions have been ignited by physical hardware channels and even e-commerce channels. Therefore, there is further need to deploy supply chain and resource integration to better manage costs and acquire cost competitive advantages.